Toroni is Sithonia’s oldest kept secret. With 3000 years of history empires have come and gone, but Toroni is still here and probably never so relaxed. Who can resist the allure of Toroni. The one attraction that Toroni has is what no one else in Sithonia can claim – a castle! Well,… at least the ruins of one. This medieval fortress on the Likythos promontory was destroyed in the 15th century. It truly makes a spectacular backdrop to the Toroni harbour. Further up the mountain towards Porto Koufo you can still find some ruins from the ancient city Torone. It was made reference to already back in the 8th century BC when Torone was aligned with the Persians against the Athenians. Perhaps Toroni’s little role in Greek history and archeology will be the worm on the hook to entice you to come. While Sithonia rewards you with endless options for putting a mask in the water, Toroni is just a little more special. Remains of ruins from the ancient Toroni harbour can still be found just some meters under the surface. Bring a snorkel and swim around the boats that are moored in the water towards the castle. Here you will get a glimpse of some wall foundations from the ancient agora. As you continue around the peninsula and into the next bay, you can see large building stones that had fallen into the water, all evidence of the important civilization that existed in Toroni about 3000 years ago. Snorkelling in Toroni isn’t just about dead history, the flora and fauna will catch your eye and leave you thinking that you just might have found Nemo! Toroni has a long 2.5 kilometre sweeping sandy beach. It is one of Sithonia’s many ‘Blue Flag’ beaches, but it doesn’t matter how full or how busy Toroni gets, this beauty never gets crowded. Then there’s the sand… the grains are just the right size so that when the sun dries you off the grains of sand fall off and remain behind. And how about the sea… transparent blue-green water deepens quickly so you can plunge in practically from the water’s edge and experience a refreshing dip! Toroni is more of a stop the car and jump off kind of town. Not much action, but a place to rest and make a comeback. Let us give some tips of what there is to do (or not do) in Toroni. Toroni is a laid-back town, people come here to get rejuvenated. Besides the beach there isn’t a lot to do in Toroni. The Toroni beach retains its character as a natural gem, unblemished and not very organized, it brings you back to a time when beach-goers actually sat on the beach not on a sun-bed. Yes, Toroni hasn’t been corrupted, while there is some beach organization with sun-beds and umbrellas everything is low-key. It would be out of character for a beach bar to play loud music or have two rows (and definitely not 3 rows) of beach beds. In Toroni there’s simply no need for it. If this is too quiet for you then shake things up a bit, go grab a frosted beer, but then you will probably head right back to your little kingdom. How’s that for excitement! Just out of fairness so you don’t think that there is nothing to do in Toroni, we are going to help you out a bit. Besides the water-sports such as snorkelling, diving, maybe a jet ski rental or even some fishing, Toroni is a pretty good place for walking, hiking and mountain biking. Just to get up and stretch your legs and take a stroll to the castle and beyond will give you some great views. You might even find you own private swimming cove or fishing hole. Up the mountain above the castle the paths wind all the way up to the summit where you can catch sight of some remnants from ancient Torone. As the sun sets, the beach is the place to head to. Whether it be for an evening sunset swim or a cocktail along the promenade, sunset is the daily event in Toroni that nobody misses. Fishermen come out and head to the harbour as the far end of the beach turns into a fisherman’s delight. Evenings in Toroni are quite easy-going, there aren’t many restaurants to choose from except for a few tavernas on the promenade. After dinner, take a romantic walk along the beach before you head back to your room to settle down for the night – tomorrow will be a new day! 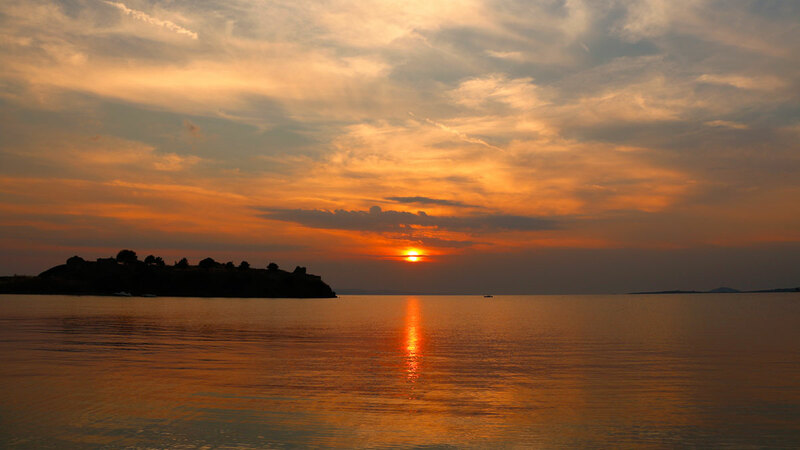 Toroni is centre to many interesting beaches and attractions. Heading north is the popular Tristinika beach with a beach bar that, except for being overpriced, almost puts you in Thailand. 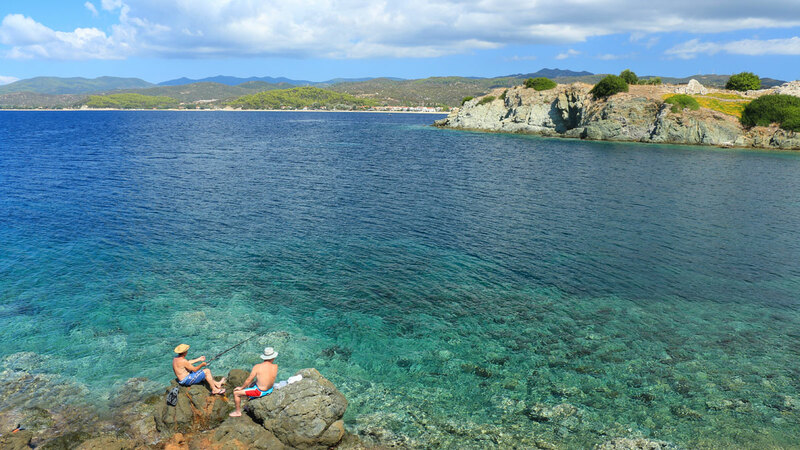 A little further north, Azapiko beach gives you a taste of untamed Sithonia. Just south of Toroni is the little fishing harbour town of Porto Koufo, here you will find some of Sithonia’s best seafood tavernas next to the pier. 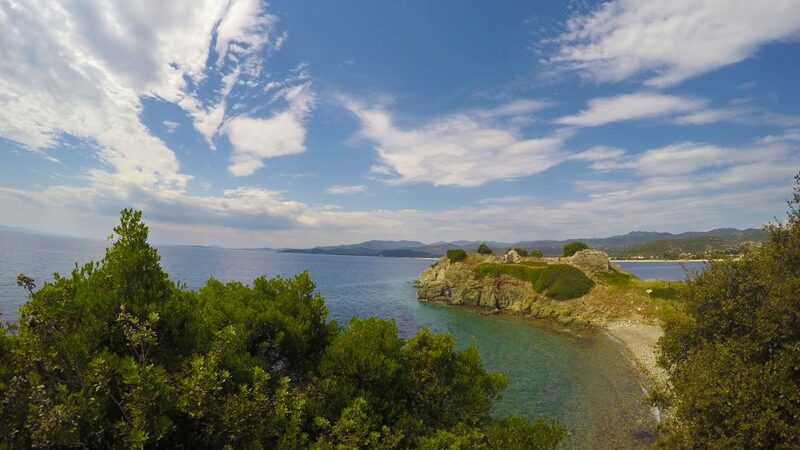 If you want some adventure with a motorbike or mountain bike, head to the southern tip of Sithonia where you may find a beach and be the sole occupant!